As I mentioned before, I decided to try my hand at making my mom's gifts for Mother's Day. I managed to complete 2 out of 3 projects rather successfully, if I do say so myself. 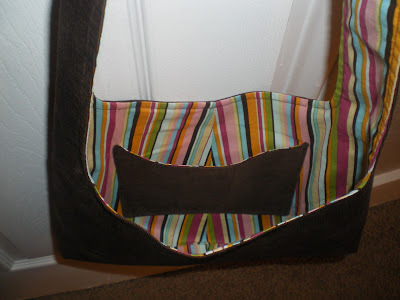 I have already posted photos of the zippered pouch and below I will include some of the purse. The purse was a challenge. Not so much the purse in its entirety, more so the handles/straps/whatever you want to call them. There was one very tricky part. 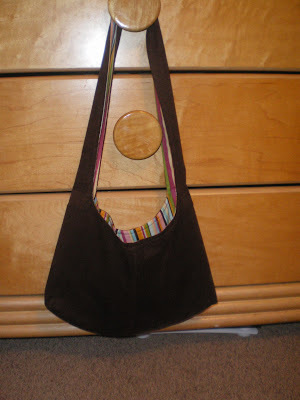 I say skip the interfacing in the handles should you attempt to make this particular bag. It also turned out a bit smaller than anticipated do to my crappy cutting skills. I was so burned out at the completion of the "mother's day bag" that I didn't plan to work on anything else for a few days. As usual, I was cutting fabric for a new project within hours. A dress this time. Click here for the totally free (best kind) tutorial and pattern. I am not quite finished with it (reason for the lack of pictures) and am not sure when I'll actually get around to finishing it. My mother and her beau are here visiting so no time for crafting. Anyways, there are LOTS of ideas floating around this head of mine and when some free time presents itself, I hope to crank out some new things, definitely including a new purse for myself. I just have to find the perfect fabric first. . .
*Disclaimer: Uhhm, please disregard the shoddy photos found on my blog. I'm no expert. And while you're busy acting like these are the most amazing photos you've ever laid eyes upon, pretend you don't see the furniture that looks like it belongs in Blanche Devereaux's bedroom or the tacky brass door knobs rearing their ugly heads throughout my house. I will address those decorating faux pas eventually! Have a great weekend, folks. I would think you would have more time on your hands now that your Mom is there? BTW-say Hi for me. I also have family in town, Andy's sister and husband. And, I have to say-it's wonderful. Not to brag.....but, I did get treated to a 2 hour nap the other day. I know isn't that amazing?! P.S. No, your pictures are not bad. But, yes that dresser needs to go! J-would love to see what you are working on! Post some pics. M-Well, they're not actually staying with us. So, between going to see them and them coming to see us, naps have NOT been a regularly scheduled event. I am definitely jealous of that 2 hour nap!! Although, naps and I don't get along. I always feel worse than I did before I laid down. Go figure. Ha ha. . . I've had that bedroom furniture for years upon years and while I do have plans to upgrade, I have a strange sort of sentimental attachment to that ugly junk.